It would be pertinent to note that transport aircraft are being utilised extensively for Human Assistance Disaster Relief (HADR) operations. 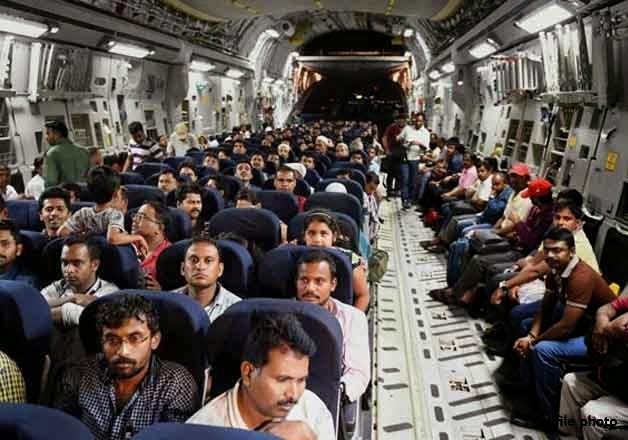 The Indian Air Force, after proving its mettle in bringing succour to scores of people after Jammu & Kashmir in September last year has once again risen to the occasion and added a pioneering chapter in Disaster Relief by bringing home the Indians evacuated from Yemen. The Indian Air Force reaffirms its commitment towards Humanitarian Assistance and Disaster Relief Operations in support of the nation. Air Chief Marshal Hrushikesh Moolgavkar PVSM MVC left for his heavenly abode on 09 Apr 15 at around 2000 h. He was hospitalised on 29 March this year at Command Hospital Southern Command Pune. He was 95 years old and is survived by a son and a daughter. Air Chief Marshal Hrushikesh Moolgavkar was commissioned in the Royal Indian Air Force on 30 Nov 1940. He served in the Indian Air Force for 38 Years during which he fought bravely against the Japanese Army in 1941. For his dedication in Kashmir Operation in 1948 and exceptional gallantry and leadership during the famous Battle of Zoji La, he was awarded the Mahavir Chakra in 1948. He was the captain of the first flight of four Ouragan fighters flown to India from France. At that time he became the first Indian to fly faster than sound, flying a Mystere-II fighter Bomber in 1951. Air Chief Marshal Hrushikesh Moolgavkar went to France and UK for the acquisition of second Generation Fighter Jet for the IAF and was one of the first to fly the MiG Fighter aircraft in 1954. He was also one of the first to fly the Gnat fighter when the IAF evaluated it at Chilboten in UK in 1954. Moolgavkar always maintained his flying status. Even as CAS, he would go on flights on MiG-21s, which also included the first flight of HAL built MiG-21M [C-1531]. On 01 Feb 76, he took over as Chief of the Air Staff of the Indian Air Force and took upon himself the task of bringing the IAF’s accident rate under control. He was always known as a stickler for flight safety. As the Air Chief, he implemented several reforms and rules that saw improvement in flight safety across the IAF. He retired from service in 1978 and settled down at Pune. The Funeral Parade is planned to be held on 11 Apr 15 at 1700 h at Shakti Dham, Golibar Maidan, Pune. A memorial service is also planned at Officers’ Mess, Air Force Station Pune. Commodore Balbir Kumar Munjal, VSM took over Command of INS India and Station Commander Delhi Area today from Commodore Vijesh Kumar Garg, VSM. After four years of successful tenure, Commodore Garg now proceeds as Deputy Director General, NCC for Tamil Nadu, Pudduchery, Andaman & Nicobar. Commodore Balbir Kumar Munjal was commissioned into the Indian Navy on 01 Jan 1986. He is an alumnus of the prestigious National Defence Academy (NDA) Khadakwasala and Defence Services Staff College (DSSC), Wellington. A specialist in Missile and Gunnery, he spent majority of his career in afloat and operational appointments. He has the distinction of being the Commanding Officer of four ships – INTRV-71, Missile Boat INS Pralaya, Submarine Depot Ship INS Amba and Fleet Support Ship INS Deepak. He has also been Chief Staff officer of 22nd Missile Vessel Squadron at Mumbai for four years besides serving as Director Naval Plans at IHQ MoD(N). For his distinguished service, he was awarded Vishisht Seva Medal by the President on 26 January 2014. “The news item published in the local media states that the State Government of Arunachal Pradesh and some Organizations have claimed that they are shocked by the sudden invocation of the AFSPA in the State of Arunachal Pradesh. In this regard it is clarified that the twenty km border belt between Assam and Arunachal Pradesh was already declared a Disturbed Area since long time due to various terrorist and insurgent groups operating in Assam. Of late, it has been observed that splinter groups of insurgents, particularly NDFB(S) and ULFA (I) have not only been using Arunachal Pradesh as a transit to Myanmar but also taking sanctuary in the bordering districts of the State with Assam beyond the 20 km belt declared disturbed along the border with Assam and as a result, Security Forces have been finding it increasingly difficult to act against them, even if they know their whereabouts. Declaration of the districts bordering Assam, in Arunachal Pradesh, as Disturbed has been made with the sole purpose of enabling the Forces to chase and arrest these terrorists and insurgents irrespective of the distance they cover in Arunachal Pradesh for a limited period till these violent Assam based groups are neutralised. Reading anything about this measure beyond this is improper and unfortunate. The State government does not seem to be comfortable with this measure while at the same time the State police has not proved to be effective in dealing with these terrorists. Under the circumstances, the Ministry of Home Affairs is left with no alternative but to ask the State government as to what alternative would they like so that the national and internal security is not compromised and innocent peace loving citizens of Arunachal are not unnecessarily affected. The Union Minister of State for Home Affairs, Shri Kiren Rijiju chaired the 2nd meeting of the Committee of Eminent Freedom Fighters at SKICC Srinagar, today. During the meeting the Committee deliberated various issues of concern to the Freedom Fighters.Issues such as granting reservation in Central Government Services to all Dependents of the Freedom Fighters, permitting Grand Sons and Daughters of the Freedom Fighters to study in the Central Schools spread all over India, providing employment to families of the Freedom Fighters including Petrol Pump, Gas Agency etc, giving job in Railways to at least one person recommended by Freedom Fighters and providing free electricity to all the Freedom Fighters were considered by the committee. The agenda of the meeting also included extending Bank Loan to Dependents of all the Freedom Fighters, providing Temporary Accommodation/Stay for the Freedom Fighters in District Headquarters, revalidation of Orders related to Medical Facilities provided to Freedom Fighters, Renewal of complimentary Railway Passes for three years instead of one year, extending free Railway Passes to all eligible Dependents/Successors of Freedom Fighters and free toll tax to all Freedom Fighters while travelling on National Highways. The issue of inviting representative from railways in the next meeting was also raised. The Committee also considered increasing the Basic Pension of Freedom Fighters/Daughters, Verification of Freedom Fighters/Dependents Family Pensioners, Switch over of PPOs from SBI to Other Nationalised banks and mandatory transfer of PPOs from treasuries to banks.The meeting was informed that the number of central freedom fighters pensioners as on January 1, 2015 was 11,434 and the widows and eligible dependents was 24,466, total of which comes to 35,900. The participants highlighted the problems faced by the freedom fighter pensioners in processing their pensions and also sought increase in the pension to unmarried and unemployed daughters. Assuring the participants, Shri Kiren Rijiju said that the Ministry will update the quota available to freedom fighters beneficiaries. In his concluding remarks, the Union Minister thanked the freedom fighters for their participation in the meeting adding that we must draw inspiration from these brave souls and ensure highest degree of respect to them. The freedom fighters who attended the meeting include Shri Vidya Sagar Shukla, Shri Radheswas Prassad Singh, Shri Rai Singh Patanga, Shri Om Prakash, Shri G.S. Mitra, Shri N.R. Mathad and Smt Rampilla Narasayamma. India is a founder Member of the International Renewable Energy Agency (IRENA), an intergovernmental organization that supports countries in their transition to a sustainable energy future, and serves as the principal platform for international cooperation, a centre of excellence, and a repository of policy, technology, resource and financial knowledge on renewable energy. IRENA has two main governing structures; one is IRENA Assembly which takes decisions at Macro level and gives policy guidance to IRENA. Second is IRENA Council which is the main Governing Body of the Agency responsible for implementing various decisions of the Assembly. The Department of Personnel & Training (DoPT) has reiterated five-year-old guidelines on framing/amendment/relaxation of Recruitment Rules to various posts. A detailed step guide (column-wise) for processing of the proposal for framing / amendment of Recruitment Rules has been reissued. The step guide material is to be used for filling up the thirteen-column Schedule to be annexed with the notification part of the Recruitment Rules for various posts under Ministries / Departments. Sub: Step guide for processing of the proposal for framing / amendment of Recruitment Rules. 2. Hindi Version will follow. (I) All the Ministries/Departments (As per the standard list). (3) Establishment Officer and AS. (6) NIC (DoP&T) for placing this Office Memorandum on the Website of DoP T.
the name of the post is to be kept as approved in the creation order of the post. the numbers of the post. Classification of the post is to be made as per the existing instructions. as per the CCS (RP Rules), 2008.
sole method of recruitment or one of the methods. • The method will be non-Selection in the rest of the promotion cases. between 18 year and 27 years. framing of RRs and incorporate specific age limit higher than 50 years. Sub-division of Himachal Pradesh, Andaman & Nicobar Islands or Lakshadweep. similar posts and higher and lower posts in the same hierarchy. may be a Masters Degree in the relevant discipline. available, the minimum required qualification/ experience need not be stepped up. The entry under this Col. will be either 'yes' or `no' or 'not applicable'. •The entry will be `No' in all cases of RRs of non-technical posts. Rs. 6600 and above, the entry shall normally be `Yes'. from a lower group to a higher group (e.g. from Group C to B, Group B to A). Group C, Group B to Group B) - no probation. and absorption — no probation. (including Short-term Contract)/Absorption on functional considerations. feeder grade torn sustain the morale and efficiency of the cadre. the method may be prescribed as 'Promotion'. 'Direct recruitment at successive level to be avoided. •Direct recruitment against isolated posts to be avoided. teaching/research/ scientific or technical posts. officers belonging to the Central and State Government and UT Administrations. recruitment under Col. No.7-if DR is a method of appointment). qualifications and experience to be prescribed. having been filled by promotion. Departmental Confirmation Committee (DCC) for confirmation to be incorporated. The DPCwill appear only where the method of recruitment prescribed in Col. No. •DCC will appear where probation period is prescribed in Column 9. Total strength of the Committee shall not be less than 3 including the Chairman. promotion is to be made. departments etc. to be decided as per instructions of DOPT. that the UPSC will not be associated with it. `deputation/promotion' or 'deputation (including short-term contract)/promotion'. promotion from PB 3 GP Rs.5400 to PB 3 GP Rs.6600. In a bid to encourage filling up of the post of Staff Car Driver (Ordinary Grade) through the method of Deputation/Absorption, the Department of Personnel & Training (DoPT) has issued orders to allow the Dispatch Riders and Multi-Tasking Staff (MTS) Group C employees, provided they fulfil the criteria laid down in the Recruitment Rules of the post of Staff Car Driver, avail reimbursement for acquiring Driving Licence for Motor Cars. The DoPT has also advised various Ministries/Departments to review the existing Recruitment Rules for the post of Staff Car Driver and bring them in conformity with the Model Recruitment Rules issued by the DoPT on July 7, 2014. Accordingly, the post of Staff Car Driver (Ordinary Grade) is to be filled by Deputation/Absorption failing which by Direct Recruitment. Vacancies of Staff Car Driver will thus be filled first by Deputation / Absorption from amongst the regular Dispatch Rider (Group C) and Group C employees in Pay Band-I: Rs. 5200-20200 Grade Pay Rs. 1800 in the same Ministry / Department who possess valid Driving License for Motor Cars failing which from employees of equivalent posts in other Ministries / Department of the Central Government who fulfil the necessary qualifications. Keeping up the tradition of bringing the latest trend and technology on one platform, Power Grid Corporation of India Ltd. (POWERGRID), a Navratna PSU and the leading T&D player of the country, today arranged another successful edition of Gridtech 2015, International Exhibition and conference. The three-day conference and exhibition organised at Pragati Maidan, New Delhi with the support of Power Ministry witnessed the participation of over 110 exhibitors and 30 technical institutes exhibiting emerging technologies at one place. The event concluded with the award ceremony which recognized the outstanding participation of the students and various national and international players. The exhibition brought together eminent set of experts from all across the world at one platform to discuss various technologies to make India a true leader in the power sector. More than hundred papers on new technologies were presented on emerging trends in the field of transmission, distribution, sub-stations, energy efficiency and smart grid technologies. Adding yet another milestone by fulfilling another commitment announced in the Railway Budget 2015-16, the Indian Railway will be setting up its own Railway Design Centre in the campus of National Institute of Design (NID), Ahemdabad. A Memorandum of Understanding (MoU) was signed between Ministry of Railways and (NID) in the presence of the Minister of Railways Shri Suresh Prabhakar Prabhu and the Minister of State (Independent Charge) for Commerce & Industries Smt. Nirmala Sitharaman at a function here today. The signatories of the MoU were Shri Alok Kumar, Executive Director (Civil Engineering), Railway Board and Shri P. Vyas, Director, NID, Ahemdabad.This MoU has been formulated for setting up a ‘Railway Design Centre’ in the campus of NID. Ahmedabad, which will be operated by the interest accrued on the endowment fund of Rs. 10 crore. This endowment fund for this purpose is being deposited by the Ministry of Railways. Speaking on the occasion, Shri Suresh Prabhu said that Railways’ partnership with NID will lead to customers’ happiness by way of better designed coaches and providing cost effective solutions to problems faced by passengers during train travel. He urged the NID to work out on the most cost effective designs for coaches as our system is generally price sensitive and quality conscious. He also informed that with this initiative, Railways has fulfilled yet another commitment made in Railway Budget 2015-16 towards improving passenger services. He hoped that with the signing of this MoU, new designs for further improving the passenger amenities will be available and put into use soon on Indian Railways. Addressing the gathering the Minister of State for Commerce and Industries (Independent Charge) Smt. Nirmala Sitaraman said that NID has been designated as an ‘Institute of National Excellence’ through an Act of Parliament and is an institute of national pride. She further added that the partnership between Ministry of Railways and NID will work for the benefit of rail passengers especially the old and physically handicapped by using innovative ideas and technology. Speaking on the .occasion, the Minister of state for Railways, Shri Manoj Sinha said that the NID under the Ministry of Commerce and Industry is a prestigious institute which is capable of benefiting the Railways with its new innovative ideas and solutions towards improving passenger amenities. He congratulated both Indian Railways and NID for this new initiative and emphasised the need for greater synergy between the two organisations towards providing innovative solutions to the problems of railway customers by providing passenger friendly services. Shri V. K. Gupta, Member Engineering, Railway Board, said that Railway Design Centre will be developing new concepts in design & innovations in various fields of Railway functioning, like passenger amenities at station areas and in trains, improvement to coach layouts, environmental issues, various maintenance tools, IT & Communication issues etc. It will be a win-win situation for both the organisations, while the Railways will be benefitted with improved concept, facilities, and assets, NID would also be benefitted with the real life projects and values to their academic and research programmes. Prof, P. Vyas, Director NID while appreciating this move, said that NID will improve passenger services through innovative ideas focusing on people, environment and sustainability through this Research Centre. This MoU will be for a period of 10 years, which can be further extended as mutually agreed. It is expected that desired results in a definite time frame will be achieved . Also present among others on the occasion were Smt. R. Ravikumar, Financial Commissioner, Railway Board and other senior officials from Ministry of Railway & Ministry of Commerce & Industry. Indian Railway sportsperson Mithali Raj, Captain of Indian Railways Cricket team has been awarded Padma Shri Award by Hon’ble President Shri Pranab Mukherjee in the function held here this week. Mithali joined Indian Railways in the year 2001 and went on to Captain not only Railways Women Cricket team but also Indian Women Cricket team. Presently she is working as Chief Office Superintendent in South Central Railways. Mithali currently tops the batting table with 703 ratings points and starred as the No. 1 Cricketer in the ODI chart among women. Mithali is also the proud recipient of Arjuna Award in 2003. “The real action is in the states if the agenda of reducing road accidents and achieving the target set under the UN Decade of Action is to gain desired momentum”, said Secretary, Ministry of Road Transport & Highways, Shri Vijay Chhibber while inaugurating the All India State Governments’ Meet on Road Safety here today. The UN Decade of Action envisages reduction in road fatalities by 50 per cent by the year 2020. Shri Chhibber highlighted the purpose of the Meet, jointly organized by the Ministry of Road Transport & Highways and International Road Federation (IRF), as to evaluate various actions undertaken by the State Governments regarding road safety and to understand the nature of assistance they may require from the Ministry. He urged the representatives of the State Governments to take steps in the direction of teaching road engineering in the perspective of the end objective to save human lives. He said that civil society should be engaged as partners in the drives to address major road safety concerns. Ministry of Road Transport & Highways has been emphasizing the need for a multi-sectoral approach to be adopted by the states towards road safety, he added. During the Meet, presentations were made by state representatives covering the current road safety scenario in the states, uniqueness, advantages, bottlenecks and the efforts being made to address these issues. An expert panel consisting of various departments as well as organisations working for road safety gave presentations on engineering, education, social media interaction, legislation and trauma care. This Press Release is embargoed against publication, telecast or circulation on internet till 5.30 PM today i.e. 10th April, 2015. The Quick Estimates of Index of Industrial Production (IIP) with base 2004-05 for the month of February 2015 have been released by the Central Statistics Office of the Ministry of Statistics and Programme Implementation. IIP is compiled using data received from 16 source agencies viz. Department of Industrial Policy & Promotion (DIPP); Indian Bureau of Mines; Central Electricity Authority; Joint Plant Committee; Ministry of Petroleum & Natural Gas; Office of Textile Commissioner; Department of Chemicals & Petrochemicals; Directorate of Sugar; Department of Fertilizers; Directorate of Vanaspati, Vegetable Oils & Fats; Tea Board; Office of Jute Commissioner; Office of Coal Controller; Railway Board; Office of Salt Commissioner and Coffee Board. 2. The General Index for the month of February 2015 stands at 181.3, which is 5.0% higher as compared to the level in the month of February 2014. The cumulative growth for the period April-February 2014-15 over the corresponding period of the previous year stands at 2.8%. 3. The Indices of Industrial Production for the Mining, Manufacturing and Electricity sectors for the month of February 2015 stand at 130.7, 192.9 and 166.0 respectively, with the corresponding growth rates of 2.5%, 5.2% and 5.9% as compared to February 2014 (Statement I). The cumulative growth in the three sectors during April-February 2014-15 over the corresponding period of 2013-14 has been 1.5%, 2.2% and 9.1% respectively. 4. In terms of industries, fifteen (15) out of the twenty two (22) industry groups (as per 2-digit NIC-2004) in the manufacturing sec tor have shown positive growth during the month of February 2015 as compared to the corresponding month of the previous year (St atement II). The industry group ‘Wearing apparel; dressing and dyeing of fur’ has shown the highest positive growth of 62.0%, followed by 35.8% in ‘Electrical machinery and apparatus n.e.c.’ and 19.6% in ‘Wood and products of wood & cork except furniture; articles of straw & plating materials’. On the other hand, the industry group ‘Office, accounting & computing machinery’ has shown the highest negative growth of (-) 44.6%, followed by (-) 43.4% in ‘Radio, TV and communication equipment & apparatus’ and (-) 8.2% in ‘Other transport equipment’. 5. As per Use-based classification, the growth rates in February 2015 over February 2014 are 5.0% in Basic goods, 8.8% in Capital goods and 1.1% in Intermediate goods (Statement III). The Consumer durables and Consumer non-durables have recorded growth of (-) 3.4% and 10.7% respectively, with the overall growth in Consumer goods being 5.2%. 6. Some of the important items showing high positive growth during the current month over the same month in previous year include ‘H R Sheets’ (216.3%), ‘Leather Garments’ (151.8%), ‘Polythene bags including HDPE & LDPE bags’ (131.6%), ‘Cable, Rubber Insulated’ (63.5%), ‘Vitamins’ (60.5%), ‘Stainless/ alloy steel’ (57.0%), ‘Apparels’ (52.5%), ‘Conductor, Aluminium’ (48.5%), ‘PVC Pipes and Tubes’ (44.9%), ‘Block Board’ (34.2%), ‘Carbon Steel’ (27.4%) and ‘Air Conditioner (Room)’ (27.4%). 7. Some of the other important items showing high negative growth are: ‘Heat Exchangers’ [(-) 54.7%], ‘Electric Sheets’ [(-) 53.9%], ‘Telephone Instruments (incl. Mobile Phones & Accessories)’ [(-) 51.7%], ‘Computers’ [(-) 51.5%], ‘Furnace Oil’ [(-) 37.5%], ‘Ship Building & Repairs’ [(-) 34.8%], ‘Tractors (complete)’ [(-) 29.8%], ‘Boilers’ [(-) 28.8%], ‘Generator/ Alternator’ [(-) 28.7%] and ‘CR Sheets’ [(-) 21.7%]. 9. Along with the Quick Estimates of IIP for the month of February 2015, the indices for January 2015 have undergone the first revision and those for November 2014 have undergone the final revision in the light of the updated data received from the source agencies. It may be noted that these revised indices (first revision) in respect of January 2015 shall undergo final (second) revision along with the release of IIP for the month of April 2015. 10. Statements giving Quick Estimates of the Index of Industrial Production at Sectoral, 2-digit level of National Industrial Classification (NIC-2004) and by Use-based classification for the month of February 2015, along with the growth rates over the corresponding month of previous year, including the cumulative indices and growth rates, are enclosed. Release of the index for March 2015 will be on Tuesday, 12 May 2015. * Indices for Feb 2015 are Quick Estimates. NOTE : Indices for the months of Nov'14 and Jan'15 incorporate updated production data. A two-day National Workshop has been conducted by the Ministry of Textiles, Government of India on 9th and 10th April, 2015 in Surat to showcase progress of the Textile Parks set up under the Scheme for Integrated Textile Park (SITP), a flagship scheme of the Ministry. In his inaugural speech, Hon’ble Minister of State for Textiles (Independent Charge), Shri Santosh Kumar Gangwar informed that SITP aims to provide infrastructure support which is critical for making textile manufacturing industry globally competitive. He said that textile parks can play an important role in this regard by attracting huge investment and generating employment. Addressing the gathering, Hon’ble Minister announced approval of 20 new parks during previous seven months, bringing the total number of parks approved under the scheme to 70. Once operational, these parks are expected to attract investment of Rs. 30,000 crores and generate employment for 11,00,000 persons. The Minister informed that Government would set up 8 to 10 more parks in the 12th Five Year Plan. These parks will be catalytic in realising Make in India vision of the Hon’ble Prime Minister. He urged the state governments and the industry to work in unison to make India a global leader in textile manufacturing. Earlier, Shri Gangwar inaugurated a photo exhibition on SITP. He also released a short film on SITP and a report on textile parks approved under the scheme. The Minister of Commerce and Industry of Manipur informed that a road corridor is proposed from Moreh in Manipur to Mandalay in Myanmar and then to Thailand which will provide better access to the South East Asian market for Indian textile industry. He reassured the industry that the state government would provide all necessary support and peaceful and secure conditions for textile investors in the state. The conference was attended by the Minister of Commerce and Industry, Manipur, Shri Govindas Konthoujam; Smt. Darshana Vikram Jardosh, MP, Surat and MLAs from Surat, Shri Harsh Sanghvi and Shri Rajabhai. Industry representatives and representatives from 13 States across the country were present as well. Field visits were organized as part of the workshop, for prospective investors and state government officials to give them a first-hand experience of successful parks. A 50-member Nepalese youth delegation led by Minister of Youth and Sports Shri Purushottam Poudel today concluded its visit to India. The maiden visit of the youth delegation from Nepal was part of Youth Exchange programme between India and Nepal. During the week-long stay in India, the Nepalese delegation visited Delhi (Rajghat, Crafts Museum, National Museum, Delhi Metro ride, Metro Museum, India gate, Jantar Mantar, Connaught Palace) Agra (Taj Mahal and NSS Programme at Agra College), Bangalore (IIM, IT Company, Chinnaswami Stadium) and Mysore (City Palace, Vrindavan Garden etc.). During the visit, a cultural programme and a banquet was organized in the honour of Nepalese Youth delegation. A meeting of senior officers from both sides led by respective Ministers in charge was also held before the cultural programme. During the meeting, Minister of State (Independent Charge) for Youth Affairs and Sports, Shri Sarbananda Sonowal expressed that India and Nepal are close neighbours and share a unique relationship of friendship and cooperation, characterized by open borders and deep-rooted people-to-people contacts. He said, India is extremely privileged to host the Nepalese Youth Delegation, which comprises, inter-alia, of youth representing various youth organisations in Nepal, young journalists, young businesspersons and sportspersons besides the officials of Government of Nepal. The visiting Minister from Nepal Shri Purushottam Poudel expressed his desire for exchange of sportspersons particularly from cricket. He said, India can provide training to Nepalese cricketers and also sought support in development of cricket facilities in Nepal. Shri Sonowal assured his counterpart of every possible support from Government of India in this regard.